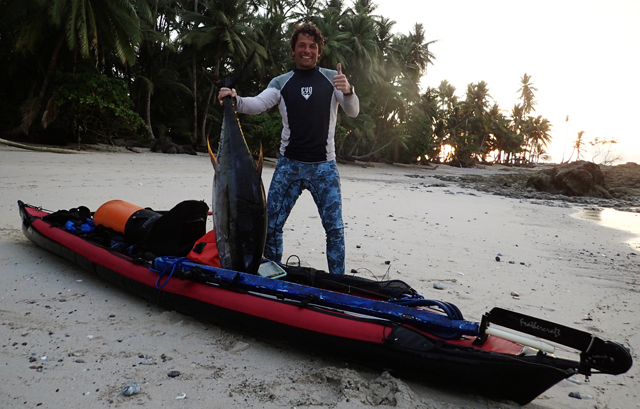 Folding Kayaks Forum • View topic - Uncharted treks in Costa Rica, Panama, Nicaragua anytime. Uncharted treks in Costa Rica, Panama, Nicaragua anytime. Post subject: Uncharted treks in Costa Rica, Panama, Nicaragua anytime. Let me be upfront - I am not a kayaking guide with any certifications. I am not offering to take anyone out on a tour for money. I am just a regular paddler in a part of the world that provides spectacular sea, lake and flatriver kayaking, without a paddling community to take advantage of it. So if any of you folding (or hard-shelled) paddlers are traveling through Costa Rica (where I now live), Panama (an hour away) or Nicaragua - I have das boat and the urge to travel. I also have a number of unexplored multi-day paddles I have been scouting out in segments, but it is turf that I am not willing to paddle alone. Military presence in disputed territory and drug smugglers are new hazards, but pale in comparison to the insanity I faced during years of kayaking the lower Hudson River and Jamaica Bay around NYC. Simply put, I'm just one guy who packed a Khatsalano and headed south. Anyone care to join? Last edited by packcamera on Wed Sep 07, 2011 8:51 pm, edited 1 time in total. Am planning to be down your way in December or January, so I look forward to linking up and paddling some of the area. Will be driving down so not sure of exact timing. I've been to Costa Rica and Panama, but sadly without a kayak. I hope to read your reports. How come there is no email or pm button I could click on under your message? I went back to Panama in 2017 for spearfishing. I camped on Montuosa island (got dropped there by boat) and was hunting tuna with my Feathercraft Java. That was so cool I'm going back next april. But before Panama, we (with wife) are going to Costa Rica. In march. We were not planning to bring the kayaks to Costa Rica (we have two inflatables, the Java and an homemade) because we were thinking mostly hiking. Also, we will rent a car in Panama (cheap), and were not planning to do so in CR (more expensive). We can't take the car across the border. The plan was to leave stuff in Panama and explore CR on foot. That was the general idea but maybe we can change plans if you tell me it is worth it. Sounds like you've got a good plan, Kayakspearo. Costa Rica is high on my list and I'd like to get there in 2019. Just in case you didn't notice, though: this thread started by Packcamera is now 7 years old and is probably no longer relevant. Beautiful tuna in your pic! Hahaha! I did not notice. Thanks for pointing that out. I won't be waiting for an answer.